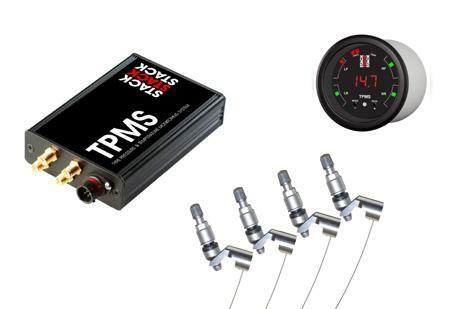 STACK TPMS UNIVERSAL - MiataRoadster - Stay tuned with MiataRoadster! Stack’s Batteryless and wireless TPMS (Tyre Pressure and Temperature Monitoring System) completely re-defines tyre pressure monitoring in motorsport. Based on patented SAW sensor technology, the problems associated with mounting batteries and complicated electronics in sensors on wheels have at last been completely eliminated. Each wheel sensor comprises of a 2mm thick x 12mm diameter SAW pressure/temperature sensor and an antenna, in a 18mm diam. x 14mm cylindrical housing weighing 10g – the smallest and lightest sensor on the market! We use, under exclusive licence for Motorsport, Transense Technologies’ patented Surface Acoustic Wave (SAW) sensor technology which offers wireless, batteryless and compact operation. SAW Sensors are passive (no power required), wireless, low cost, rugged, and extremely small and lightweight, making them well suited for measuring pressure, temperature & torque (strain) in moving objects (e.g. tyres, drive shafts etc.). These characteristics offer significant advantages over technologies such as capacitive and piezoresistive sensors, which require operating power and additional electronics to make a wireless connection. The SAW pressure & temperature sensor can be easily integrated into a racing wheel with excellent results. These systems enable the user to measure the pressure in each tyre up to 20 or more times per second. These higher sampling rates can be used to improve chassis set-up, as well as provide an early prediction of tyre failure. The ability to see the dynamic effect of wheel and tyre loading through individual corners, rather than just over a lap, and from lap to lap. A much faster response and earlier warning of a tyre deflation – up to 0.9 seconds earlier! Pressure and Temperature data output on user configurable CAN bus. Calibration information is held in each sensor – no need to upload calibration tables into each interrogator module. Advance warning of tyre issues (including slow puncture detection) prevents costly accidents and injury. Tyres provide the biggest and “easiest” performance gain. The right pressure and temperature on the warm up lap can give you a performance advantage to make up many places during the first lap. Data analysis can control tyre wear, allowing a change in driving style to maximise tyre life. Lightest TPMS sensor available – only 10g, which means it can be used as a partial counterweight to the valve. The battery based sensors are typically 35-70g each, plus the need for a counterweight. The Stack solution can remove 70-140g or more from each wheel, or a total of 280-560g of unsprung weight! Higher operating temperatures – our sensors are calibrated up to 150°C continuously, and can run higher without permanent damage. Higher sampling rates, without the need to replace batteries – continuous sampling from 1Hz to 40Hz, with no adverse affect on sensor life. Longer sensor life, and hence significantly reduced operating costs. The sensors have a typical life of 5+ years, compared to the battery based sensors which typically require annual replacement. Totally eliminates the requirement to replace batteries in-season (if the sensor has replaceable battery), reducing operating costs, and increasing long-term system reliability. The benefits of a battery-less solution are amplified in a wind-tunnel application. The longer running times associated with wind tunnel testing means that a sensor battery can be exhausted in as little as 1 week, running at 1Hz, or less than one day running at 10Hz! The Stack battery-less sensor can run at 10Hz indefinitely. No recycling issues in disposing of batteries. Each wheel sensor is mounted internally on the wheel rim or valve. The Interrogator Module is mounted in a convenient location on the vehicle, and 4 antennas are each mounted locally to each wheel (within approx 0.5m of the wheel), and connected to the Interrogator Module by RF cable. The supplied configuration software features a comprehensive set of tools to assist in antenna setup. The CAN data output can be connected to the 52mm colour LED display gauge or any standard data acquisition or driver display system supporting CAN. The interrogator module takes readings of tyre pressure and sensor (air) temperature from each wheel sensor continuously at a pre-defined rate between 1Hz and 10Hz. pressure and temperature data for each wheel is output on CAN bus, with user configurable CAN-ID messages. The unit can be configured over a standard RS232 link from the PC using the supplied PC configuration software. The easy to use software can be used to set CAN IDs, monitor values in real time, authorised sensors, set calibrations and import sensors to the system’s library (database). There is also an atmospheric pressure offset to fine tune the system to the day’s environmental conditions. Stack TPMS: Pro or Lite? Stack TPMS is available in two variants: “Pro” and “Lite”. The Pro system offers greater resolution and accuracy over the Lite system. The RFID wheel management facility, including automatic detection of wheel changes, is also only available on the Pro system – important if wheels are regularly changed. An expanded CAN-bus capability is also a feature of the Pro system. Public transportation – buses and coaches.